How to create fun and festive Easter bunny napkin fold for a casual holiday breakfast table setting. Hello and Welcome! I am glad you’re here! Can you believe that Easter is just a couple of weeks away? 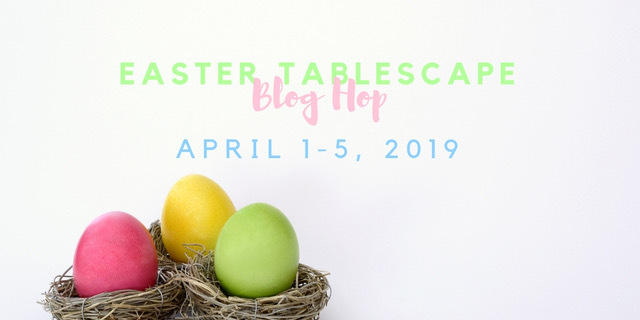 Today I am so excited to join in on the Easter Tablescape Blog Hop, hosted by the lovely and talented Chloe, from Celebrate and Decorate. This week-long blog hop is the perfect place to visit if you’re looking for some Easter inspiration. 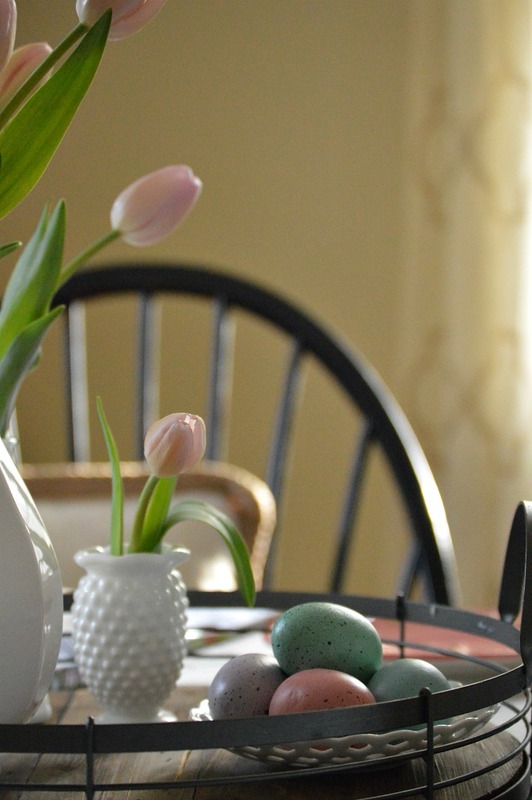 I hope you enjoy my casual Easter breakfast table and then head on over to the links at the end of this post to see all the different looks created for Easter tables! After a long and cold winter here in Connecticut, I am ready for the sweet sounds of birds chirping, colorful blooms, and the sun to bring its light and warmth. I am ready for Spring. Spring is like a promise of a fresh, new beginning. So to celebrate this season, I hung my DIY Springtime Wreath on our front door and decorated our home for Easter. I started with a plain muslin table runner as a base. 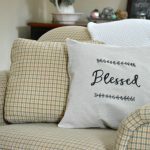 I had bought mine a few years ago at Hobby Lobby, but you can find a similar one here. A few years ago a friend’s mom had made these adorable two-sided Easter napkins. Since I have eight of them, I decided to use the gingham side as a place mat. 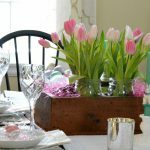 For a centerpiece, simple grocery-store tulips in a light shade of pink were tucked into an ironstone pitcher, and two small milkglass vases. The flowers were clustered on a farmhouse-style tray, with a simple white dish filled with faux pastel-colored eggs. On a white dish, these adorable homemade napkins, folded in a fun and festive bunny shape, hold a a cinnamon chip muffin from Fresh Market. These will be a delicious treat to get our breakfast started. Fold your ironed square napkin in half diagonally to create a triangle. Fold the point of the triangle in to the bottom of the triangle. Beginning at the bottom of the triangle, continue to fold diagonally, in folds of about 1 1/2 inches. Bring the ends together (these are the bunny ears) and tie with a ribbon. Many people like to wrap the napkin around an Easter egg. You can use a real, faux, or plastic egg. No matter how you choose to set your holiday table, I hope that it is surrounded by loved ones. 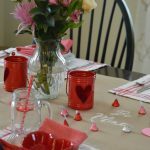 Please take some time to visit all of the blogs and see all the beautiful tables these talented ladies have created! Lynne I adore your bunny napkin fold and thanks for the instructions on how to make them. 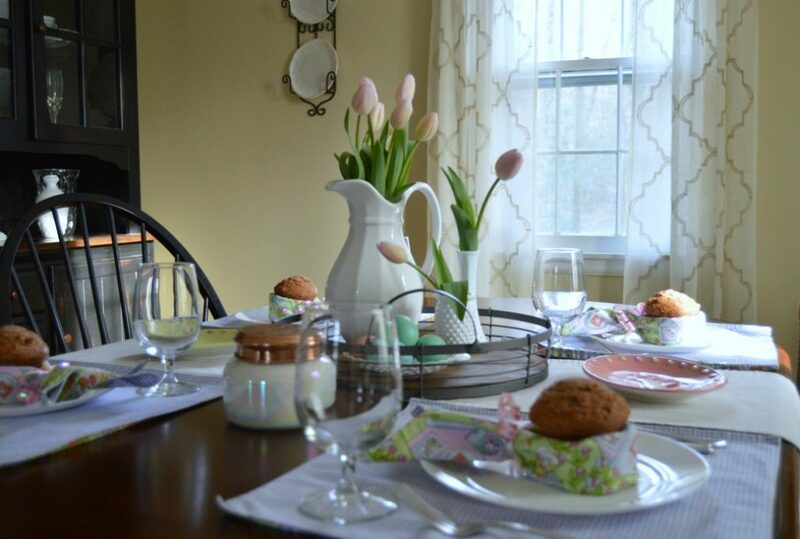 The pink tulips in the ironstone pitcher and hobnail vases are perfect. I would love to come to breakfast at your table, the muffins look delish. Happy Easter to you and your family. Looking forward to the next blog hop with you. How cute those little muffins are wearing sweet bunny ears! 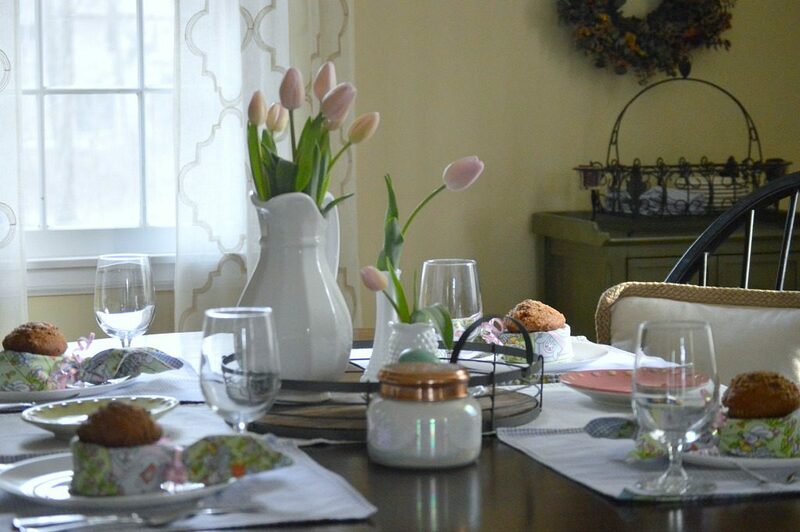 Those soft pink tulips are the perfect simple centerpiece for a breakfast table. I like the simple use of the white pitcher and vases for the tulips. Thank you so much for joining in another hop! Awww so cute! I love the napkin fold and the table is so welcoming with its lovely check placemats. The ironstone vase filled with tulips is my favorite thing. You set a lovely table and it is a pleasure to be on the hop with you. Hugs! How adorable! 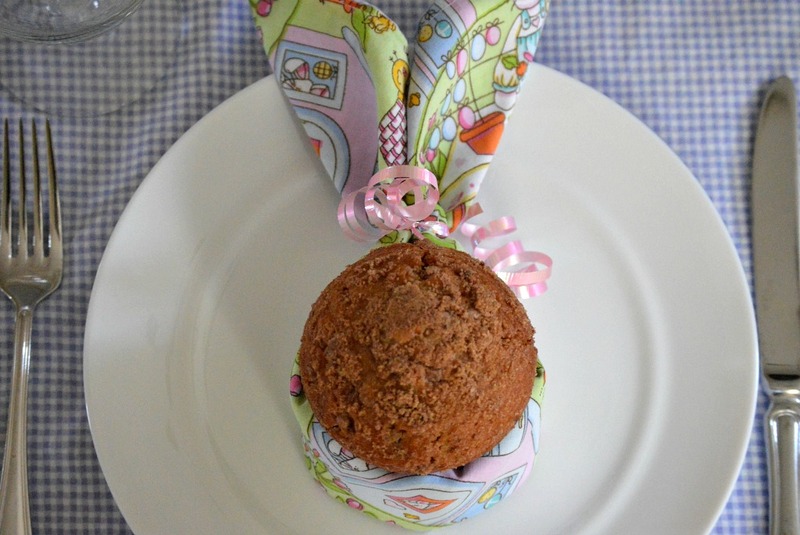 What a perfect Easter treat, a bunny wrapped muffin! I love the soft pink tulips in the white pitcher too, everything is simple yet wonderful, elegant yet fun! What a great hop we’ve had! Lynne, we used the same napkin fold for our Easter tables, but with different presentations — great minds think alike! Mine holds faux chocolate eggs and was placed in stemware in order to stand. I love that you placed a breakfast muffin in years and laid it on the plate. Clever girl! I love your take on the Easter bunny napkin fold with the muffin in the center…festive and tasty! Fun hopping with you this week, Happy Easter! Lynne, it is great to see that even the food we eat can be so beautifully displayed! I love your use of a napkin wrapped around your delicious muffin as bunny ears and served on a lovely place setting that speaks of Spring. Your tulips in various white pitchers makes for a lovely centerpiece–your table is soft and delicate –like a warm Spring breeze. So lovely. Happy Easter! Lynne, Love your fresh tulips and the darling milk glass vases. I’m crazy about hobnail milk glass. Your bunny napkin fold is adorable and that muffin looks wonderful. Happy Easter! Enjoyed blog hopping with you. Lynne, your bunny napkin fold with the muffin is so cute! Thanks for sharing a tutorial. Your pink tulips are a perfect centerpiece. It has been fun hopping with you. Wishing you a most blessed Easter! Lynne, love your darling muffins with the bunny ears, so creative and fun. Your ironstone pitcher looks amazing with the tulips. A pretty spring table perfect for Easter. Happy Sunday. Such lovely ideas for a wonderful Easter breakfast! I love how you used the muffin (which I know is delicious, btw) in place of an egg – so creative! I hope you and your family enjoy a perfectly peaceful and loving Easter morning! How cute is your bunny napkin fold! This table is fun, pretty and very inviting. 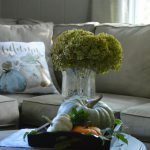 I love the soft feeling of this tablescape. Happy Easter!